Jane Austen and her books have been the inspiration for a wide variety of books over the years as sequels, adaptations or inspired stories. All have kept Miss Austen and her characters alive in a myriad of forms. 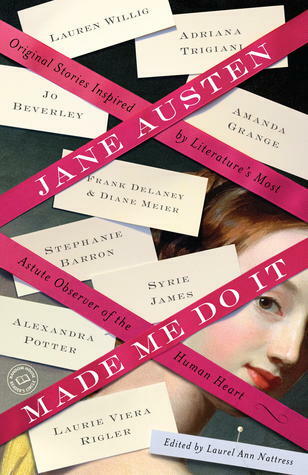 Jane Austen Made Me Do It: Original Stories Inspired by Literature's Most Astute Observer of the Human Heart edited by Laurel Nattress is new to the Austen inspired works and is an anthology of twenty short stories. It is rather difficult choosing favorites from these original stories, but some did stand out more than others. "Jane Austen's Nightmare" by Syrie James features Jane Austen being confronted by her characters during a walk around Bath. Some characters are pleased with their attributes and others find fault with Miss Austen's characterization. "A Night at Northanger" by Lauren Willig is a modern day ghost hunter tale set at Northanger Abbey. "The Ghostwriter" by Elizabeth Aston features a frustrated writer who encounters the ghost of Jane Austen. "What Would Austen Do?" by Jane Rubino and Caitlen Rubino-Bradway is a tale about a modern teenage boy. He is forced to participate in summer activities at the local library/community center, takes a dance class, and winds up reading Jane Austen which changes his dress, manners and life. 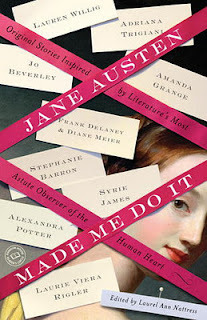 Ms. Nattress has provided an Austen-inspired fiesta with Jane Austen Made Me Do It. As with most of the Austen inspired works, there are some that use Austen characters and others that prominently feature Miss Austen as the focal point. Rather than read one story after another, I read one story at a time with breaks spanning a few hours. I found that this allowed me time to enjoy each story before reading the next. If you love Jane Austen then it will not matter if you read this in one setting or take a few days, you will find enjoyment. Some of these stories may be more pleasing than others but I find this to be true about Miss Austen's original works as well. Head over heels with What Would Austen Do - just so fresh and a total original. Bought the book on the basis of three Authors - the Rubinos were two of them!